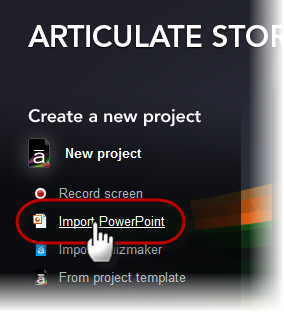 Note: Importing PowerPoint content into Storyline is not an exact one-to-one conversion. As a result, text may look a bit different. 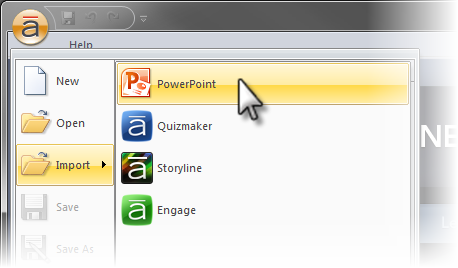 And although most features in PowerPoint and Articulate Presenter are supported in Storyline, some are not. Click here for details. Go to the Home tab, click New Slide, select the Import tab, and click the PowerPoint option. 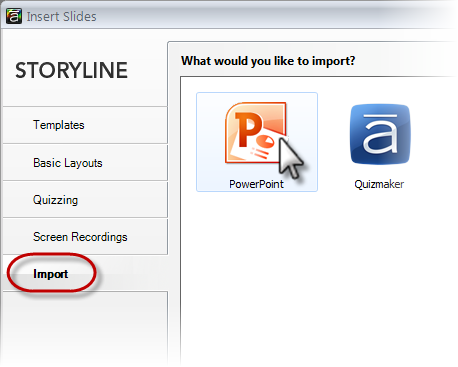 Go to the Insert tab, click New Slide, select the Import tab, and click the PowerPoint option. In Story View, right-click anywhere in the workspace, select New Slide, select the Import tab, and click the PowerPoint option. In Normal View, right-click anywhere in the left navigation pane, select New Slide, select the Import tab, and click the PowerPoint option. 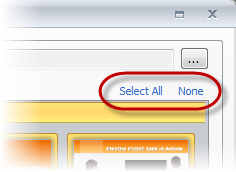 Then browse to and select the PowerPoint file that contains the slides you want to import, and click the Open button. If you opened the wrong PowerPoint file or want to select a different PowerPoint file, click the ellipsis (…) button in the upper right corner to browse for another file. Use the Insert into scene drop-down list at the bottom of the window to specify where you want the PowerPoint slides to be inserted in your story. You can insert them into a new scene, which is the default option, or you can choose an existing scene. If you choose to insert a new scene, use the Scene field to assign a name to the new scene. Note: If your presentation includes Quizmaker quizzes or Engage interactions and you encounter an error message that one or more of them could not be found, review this article to find out how to correct it.